Ever since I first saw a Segway Personal Transporter, I have wanted to ride one. Even hearing that the company’s president died when he fell from a cliff on his Segway didn’t diminish my desire to try this unique form of transportation. When talking with Flight of the Gibbon about their ziplining tour, they brought up their Segway Gibbon tour in downtown Chiang Mai, Thailand, and asked if I was interested in reviewing that as well. Excited doesn’t really begin to express how I was feeling at that point. I would finally get to be that silly-looking person wearing a helmet and standing on two wheels. 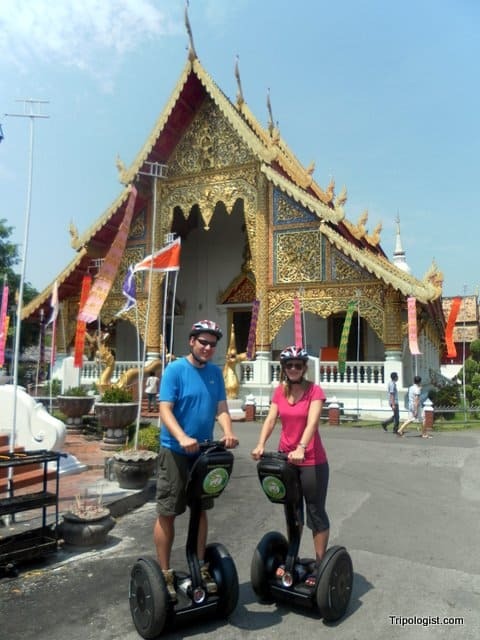 The Segway Gibbon tour leaves from their office just outside of the old city, near Tha Phae Gate. After a brief introduction to the Segway and a bit of practice inside of the office, you’re ready to go. I was initially nervous about stepping onto the Segway. I’m not exactly an Olympic gymnast when it comes to balance, and I was afraid that I wouldn’t be able to get the hang of it. However, after about 5 seconds of wobbling around in the office, I was able to figure out the balance and felt very comfortable from there on out. My wife and I outside of Wat Prha Singh. The first stop on the tour is a hotel parking lot for a bit of practice and instruction. From there, you are taken single-file along the road and into the plaza in front of Tha Phae gate for a few more minutes of practice in a more open area. This is where you really get to practice riding your Segway at full speed and practice turning and stopping. At this point, I knew I was hooked on the Segway experience. After a few minutes of practice, our guides led the way along the road to Wat Chiang Man, passing through Somphet Market on the way. At first, I was nervous about the thought of riding along the busiest streets of Chiang Mai’s old city; however, the guides with us did an excellent job keeping us safe. During the tour, we always had one guide in front and one guide in the back. When we reached street crossings, they waited for a large break in traffic and even had a little stop sign that they held out to stop the traffic. When we arrived at Wat Chiang Man, we paused for a few minutes while our guide told us the history of the temple and why it was significant to Thai history. We then proceeded to move through the temple’s grounds, turning heads as we went. From Wat Chiang Man, we proceeded to the Three Kings Monument and then Wat Phra Singh, the most important temple in Chiang Mai’s old city. At each stop, we were given historical information and our guide even offered to take pictures of my wife and me while we were on our Segways. 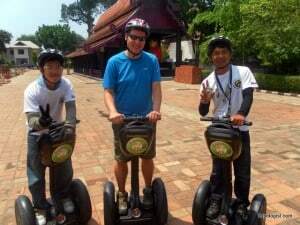 The Segway Gibbon guides and I checking out Chiang Mai, Thailand. After Wat Phra Singh, our guides took us to a little coffee shop inside the old city for a complimentary drink and snack. This was a nice chance to get a break from the late-morning heat and ask our guides questions about the city. Our guides were very knowledgeable and friendly and spoke excellent English. When we had finished our snack break, our tour continued on to Wat Chedi Luang and Wat Pan Tao before ending with a bit more play time in the plaza next to Tha Phae Gate. Overall, I really enjoyed my tour with Segway Gibbon. I felt that the equipment was in excellent condition, safety was a top priority, and that the itinerary was well-chosen. 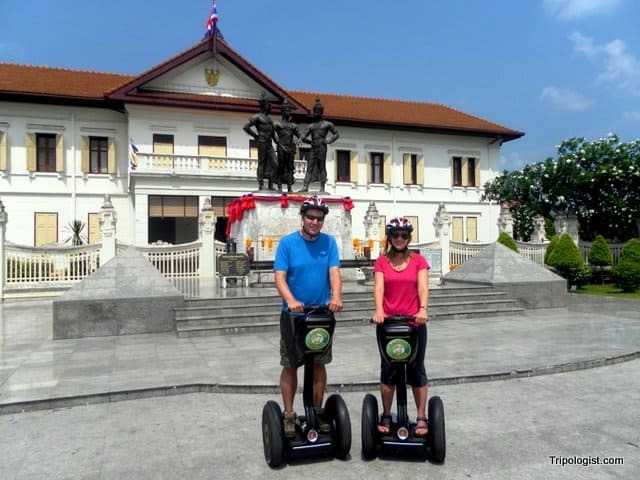 Due to the high-price of a Segway PT (they start around $6,000), a tour with Segway Gibbon is more expensive than the walking and bicycle tours available in Chiang Mai, but provides you with a unique and fun way to get around the city. Even my wife, who loves riding a bicycle, was very glad that we had taken the opportunity to see the city via Segway. Segway Gibbon tours run for 2-hours and cost 1,999 Baht ($65 USD) which includes a drink, snack, and t-shirt in addition to the guided tour. They also offer a mini-tour for 1,399 Baht. The maximum tour size is set at seven, so you are always guaranteed a small group. If you are in Chiang Mai and have ever had any interest in riding a Segway, I would highly recommend that you take a tour with Segway Gibbon. Disclaimer: In exchange for writing this review, Segway Gibbon provided my wife and me with half-price tickets. However, the opinions expressed in this article are my own. This really looks like a neat way to see the city. I think I would like to try it sometime.